That does not seem like much of a downside to me, the worst that can happen is you have to return to earning a living... and nothing can take away the experiences that you enjoyed while you were retired. Alfred Lord Tennyson's poem In Memoriam:27, 1850: states in part "'Tis better to have loved and lost Than never to have loved at all. That is exactly how you should look at trying to retire early...we have been blessed and have been retired since 1994... you cannot put a price tag on the wonderful experiences we have had together. We have had experience in the following lifestyles that all have one thing in common... they are inexpensive... maybe they will get you to thinking about early retirement as well. 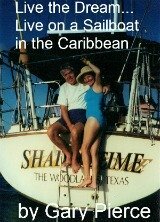 We realize that living aboard a sailboat is not for everyone. 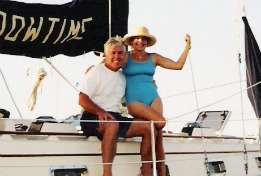 5 years before we retired to boat life , neither one of us had ever been on a sailboat, we just knew we wanted to do it. We are not trying to sell you on anything, we are asking you to just stop and think of different ways to achieve your dream of retiring early. It does require some planning and here's how to proceed in determining if the early retirement is something you want to do. If you have not gone there yet and looked at our lists of things we never want to do again and things we want to do, please take the time to see how we started. After identifying what you want to do, you simply have to convince yourself that it is worthy for you to do so. Never ask anyone else "When can I retire?" That is a decision best left up to yourself. There is one final checklist you should write out. If you try early retirement...and it doesn't work out, for whatever reason, what happens?...You have to go back to work. That's it, that's the downside. It is a condition you have probably been involved with for 30 years or more...what is the big deal, you are working now. I realize that this is more or less daunting depending on what your skills are. This is a no brainer for a carpenter, electrician, or other tradesman or woman, that work will always be available somewhere. It is probably toughest for a salaried worker for a corporation, I used to be in that category before I switched to commercial real estate brokerage...self employed. It can be done by anyone with a strong desire to retire. My personal mind set has been I have earned money before, I can do it again, but I would rather stay retired by living frugally. If this is you, we can help, retired since 1994 and enjoying life; not earning ; and spending less. Try early retirement...are you running out of excuses, not to at least try?